We love sharing the aroma of our kitchen on the road with you! Stop by and taste the goodness of freshly roasted nuts at one of these roadshows near you! All dates are subject to last minute changes so please check back to confirm or call Costco to verify. 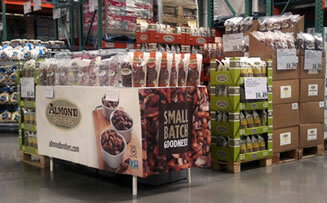 Enjoy fresh roasted Almond Brothers Nuts at a Costco near you and take some home! Enter your email address and we'll send you an occasional promotional, new flavor alerts, special site-wide sales events and more! And know we never share our email lists, that would be nuts!